Travel & Hospitality is a crucial sector for Campaign Monitor. To target these potential customers, we launched an integrated industry campaign. The team consisted of myself, a copywriter, product marketer, a GTM lead and a project manager. The product marketer would provide a messaging matrix, and the GTM lead the campaign strategy. Below is a basic overview of standard assets to be delivered. The copywriter and I then brainstormed campaign themes, with some initial sketches on potential ideas. 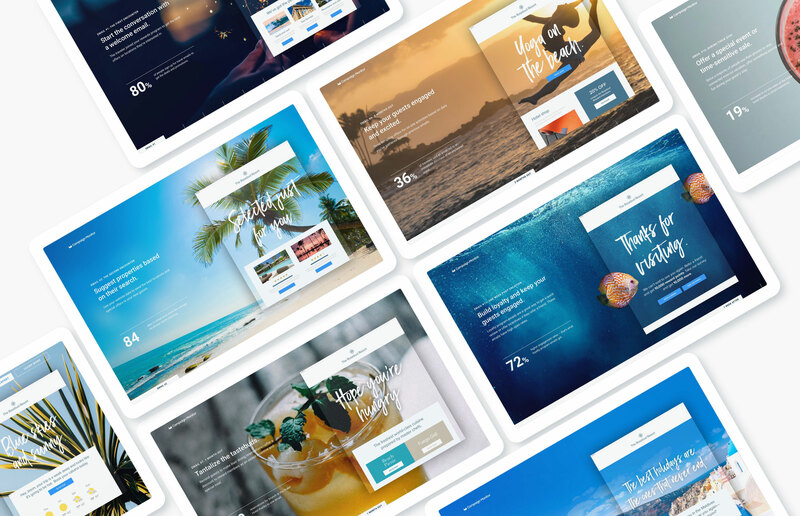 Each theme would target customers in a specific way, leveraging different parts of the product. We then presented 3-4 theme options back to the team, with an overall goal to get a direction signed off. I then took this theme and developed a number of potential ideas for campaign messaging and assets. Landing pages, social, guides, feature pages, and videos were all part of the campaign. 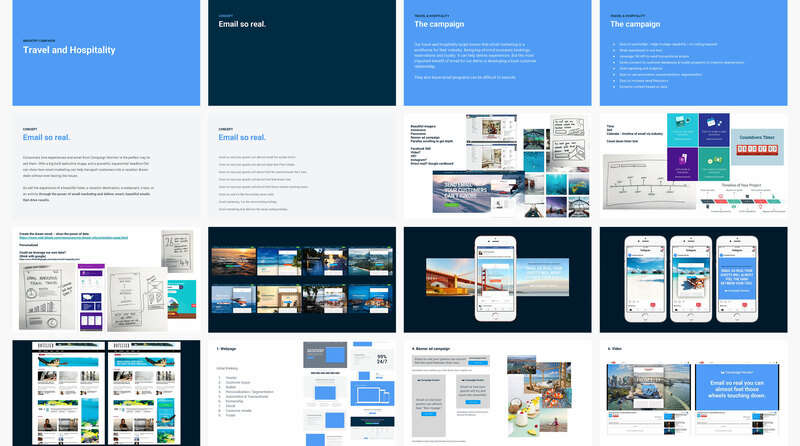 Through an iterative approach, an timeline case study was chosen to accompany the standard assets of the campaign. Once the idea had been signed off, I set out by wireframing and exploring UX options. I collaborated with a copywriter to make sure the messaging was impactful and hitting on key marketing messages. In tandem I iterated on the user journey, making sure the hierarchy was correct, and the page was structured in a way that was easily understood. 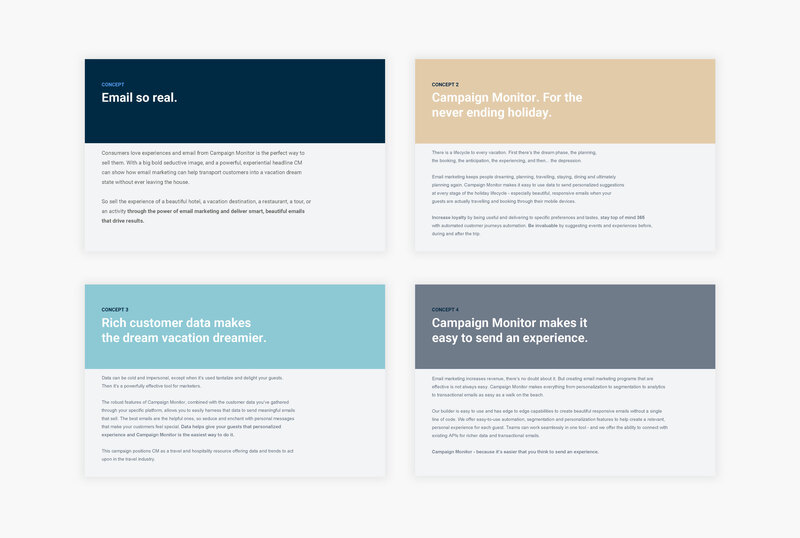 The theme 'email so real' permeates through all messaging and design on the campaign landing page. Once the UX, story, and design was on track, I re-engaged with the developer to get his expertise on how to structure and build the page. Building a structural foundation first, we managed time constraints to allow for extra animations and design polish. Working with the GTM lead we would monitor the success of the campaign through multiple tools. Tweaking design UI/UX as necessary. Results would be presented to the larger group to understand key learnings and successes. 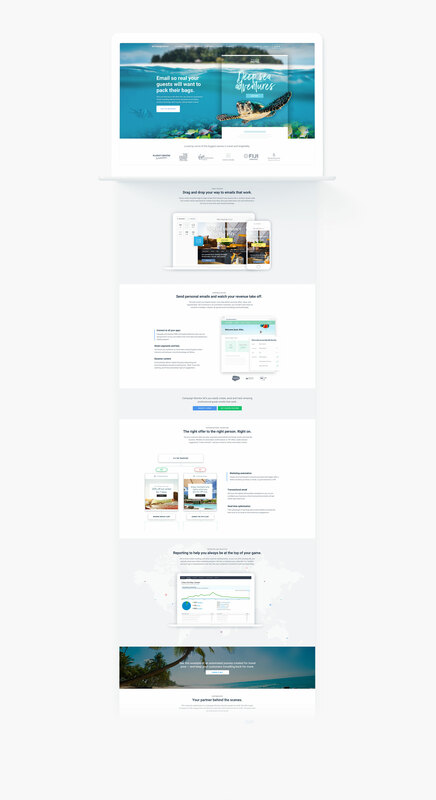 In addition to the campaign landing page, I created an animated landing page that gave the user multiple examples of how they could utilize email marketing. These examples were backed up by industry data, shown on the page. 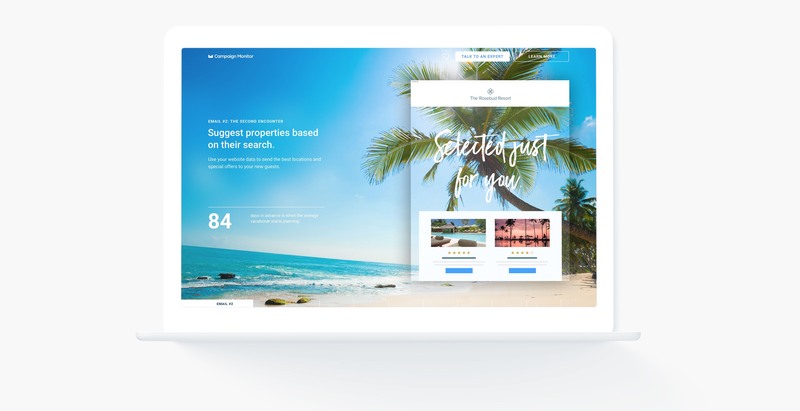 Following the 'Email so real' campaign these the design leveraged fullwidth beautiful images and animation to communicate the message. The background images permeate the email examples. As social was core to driving people to the pages, I leveraged facebook 360. The user can interact with the email inside a 360 image.